So this week I've been working with pulled chicken, and using it in a few different recipes. Basically, I've been trying to save myself some time during a busy week when making dinner. So I started by make a big batch of pulled chicken on Sunday, and then have been making a variety of dishes all week to use it up, but to use it without getting bored of it. I have made an Italian style eggplant and tomato casserole, as well as pulled chicken tacos. Today, I gave a chicken salad that is incredibly flavorful, light and very different from your typical chicken salad. It is also a breeze to make. Chicken salad, as a salad! I start by thinly slicing and then chopping two slices of red onion, or however much you want in the salad, and then chopping a small handful of frisee (or curly endive). 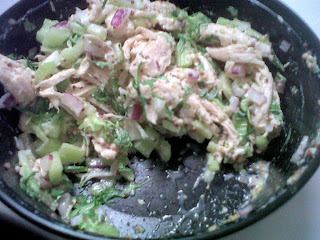 Combine the onion, the frisee and a handful of the pulled chicken, again dependent on how much your making. In a separate small bowl, combine a tablespoon of light, or reduced fat mayo, a tablespoon and a half or so, of coarse ground Dijon mustard, and a 1/4 teaspoon or so of Golden's mustard powder. Stir this into the chicken mix, and the salad is complete. Honestly, this is my new favorite chicken salad. It has so much flavor from the dressing- spicy and creamy all at once, and great textures from the frisee, and the chicken. Everything blends really nicely all together. Again, this is a really easy salad to throw together and bring in a container for lunch, or to pack into a sandwich. Rounding out this week, we had three entirely different meals all made from the same, easy to make, protein. Each one was healthy, satisfying, and included such different flavors. I know that there are tons of way of switching up a leftover and making brand new dishes from it that are both delicious and easy. What are your favorite Sunday meals to make? Let me know and I can try to twist them up for a week! Well now this just looks delicious!